We participate in Community Supported Agriculture (CSA)—that is, year round we purchase a share of vegetables grown at Cedar Circle Farm, an organic farm nearby in Vermont. The arrangement is we purchase the vegetables before they are grown and then have the delightful task of going to the farm once a week to bring home freshly grown and picked produce. When we first joined the CSA, I have to admit I found the process daunting. I’m someone who used to like to plan meals ahead. I’d sift through cookbooks and make elaborate grocery lists to be sure I had everything I needed on hand. I even posted family menus for the week on a chalkboard in our kitchen. Seriously organized stuff, eh? But once we started the CSA, I had to let go a bit. It forced me to start thinking about our meals in a more casual way. It forced me to be more adventurous. Most often items are familiar—potatoes, salad greens, corn—but every once in awhile there are new things I haven’t worked with before like black radishes, kohlrabi, and celery root. It’s also made me more creative, less afraid of experimenting with new ingredients. Our family meals are still delicious, and I think they’re better. Everything is fresh—the ingredients spark new ideas and from new ideas come relaxed times at the dinner table. I find that even when I’m shopping at the grocery store, I’ll linger over new things I haven’t seen before and throw them into the shopping cart just for fun, making up a recipe or menu in my head as I wind my way up and down the aisles. These lovely wild leeks caught my eye immediately. Displayed in a flower vase, they were beautiful and enticing. Knowing they are only available for a very short time in the spring, I snatched up a bunch to bring home along with other ingredients to make this Spring Vegetable Salad with Wild Leeks and Naan. The leeks are so tender that their greens are edible. I chopped and tossed them with asparagus, broccolini, cherry tomatoes, and micro-basil, then tossed the salad with a bit of fresh lime juice and olive oil. Topped with a bit of ricotta salata and served with some heated Naan, this is a light and delicious lunch. Or, consider serving it for dinner accompanied by some grilled meats and chilled wine. Experience the freshness of spring in every bite. Put a large pot of water on the stovetop and bring it to a simmer. Carefully place the asparagus and the broccolini into the simmering water. Simmer until the vegetables are tender, 3 to 4 minutes. Drain the vegetables in a colander and rinse immediately with cold water. Chop into small pieces and place in a large salad bowl. Add the prepared leeks, cucumber, carrots and tomatoes in the salad bowl and toss together. 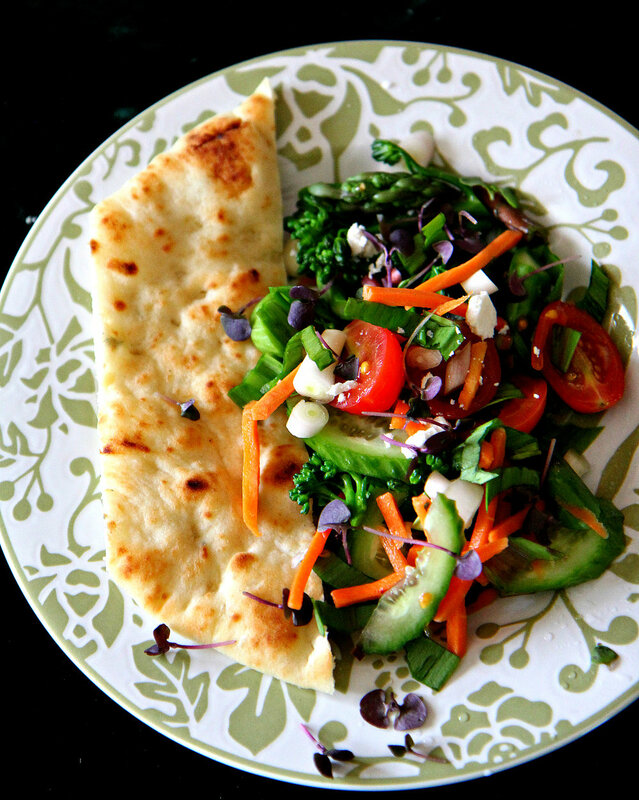 Place the naan in the oven to heat through while you finish the salad. Add the olive oil and lime juice to the salad. Toss together. Divide the salad between 4 dinner plates. Top with micro-basil and ricotta salata. Sprinkle with sea salt and freshly ground black pepper. Remove the naan from the oven and place one or two slices on each of the serving plates. If wild leeks are not available, substitute fresh scallions and 4 handfuls of spring greens. If micro-basil is not available, substitute a favorite fresh herb, pea shoots, or microgreens. Any flat bread, such as pita or Iranian Flatbread, can be substituted for the naan.